B.C. 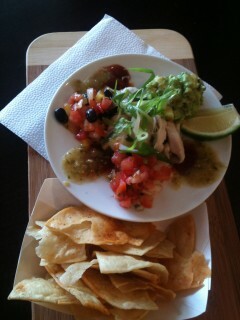 Rock Fish ceviche with guacamole, pico de galo and mango, blackbean salsa with homemade tortilla chips. The chef, AJ Taylor, a buddy of TacoLot owner Jon Reilly Roe, says the menu will grow and evolve over time, but the idea is to perfect the key menu items first. He tells me that from now on all the cooking for TacoLot and Hang 10 (including future catering gigs) will be done in the new location. The tacos at TacoLot will be freshly assembled at the Wellington spot, but all prep work and cooking is being done on Gladstone. 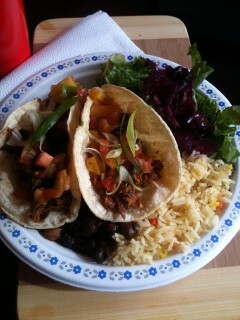 This begs the question of what’s happening to Hintonburg’s beloved taco shack for the coming winter months. Apparently the idea is to transform it slightly so that customers will be able to walk in the side door (currently, customers stand outside and order at the window) and order food for take-out. With less room needed for cooking, Reilly Roe is considering adding a few seats inside TacoLot for customers who wish to dine in. He’s also pondering offering a delivery option. Chicken taco platter. Most items are served on take-out-friendly paper plates. The menu thus far consists of a choice of slow-cooked pork, chicken, spicy beef, shrimp, or vegetarian fillings (sweet potato, squash, brown rice, and beans) in the form of a taco ($5 each), tostada ($4 each) or a burrito ($8). Each item can be made into a platter with salad, rice, and slow cooked beans ($12). The corn chips (but not the tortilla themselves) are made inhouse and are served with fresh pico de galo, guacamole, and mango black bean salsa ($5). The chips and dips can also accompany some B.C Rock Fish ceviche for $10. 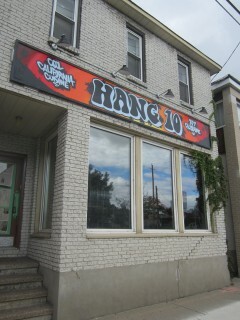 HANG 10, 707 Gladstone Ave. 613-608-1038.